In 21 days, I lost 22 lbs!!! For Channa, the 21-Day Program was a way to kickstart a healthy lifestyle and learn that healthy food can taste good! I tried Cori’s 21-Day Kickstart after seeing how great my wife was doing on it. In 21 days, I lost 22 lbs!!! I love to eat so I was hesitant about being on a meal plan; but the food was great and filling. Besides the weight loss, the plan taught me how to manage my portion sizes and still feel full after every meal. 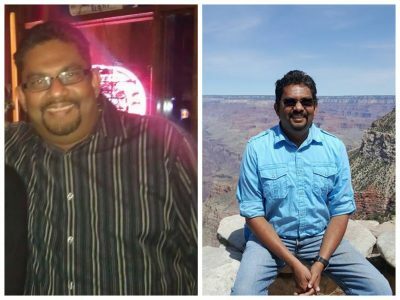 Since the initial kickstart, I’ve continued with the good habits I learned and have lost a total of 40 lbs. I still love to eat, but now I can eat and stay healthy! So proud of Channa’s success! Channa continued his weight loss journey as one of my Elite Workout Library clients. First he started with just recipes and then he started adding in the workouts. He continued his progress with the Elite Workout Library that you get a 30-Day FREE TRIAL to as part of the 21-Day Program! And he’s lost even more weight and improved his energy! Join RS's Kickstart - Just $10.50! Make a change and let me help you achieve your goals with our 21-Day Kickstart and Elite Workout Library. Get it for 50% off with code 22in21 entered at checkout! That means you’ll get the Kickstart and a 30-Day FREE TRIAL to the Library for $10.50 (usually $68! ).